Duke in Cotton Club Premiere! In 1927, a band started to perform at Harlem’s Cotton Club. With a weekly radio broadcast, famous white clientele nightly poured in to see them. The Band belonged to young Duke Ellington and the first night at Cotton Club was on December 4, 1927! Edward Kennedy “Duke” Ellington, this American composer, pianist, and big-band leader wrote over 1,000 compositions. According to Bob Blumenthal’ s of The Boston Globe opinion, “In the century since his birth, there has been no greater composer, American or otherwise, than Edward Kennedy Ellington.” A major figure in the history of jazz, Ellington’ s music stretched into various other genres, including blues, gospel, film scores, popular, and classical. In Cotton Club period “Duke Ellington and his Kentucky Club Orchestra” grew to a ten-piece organization; they developed their own sound by displaying the non-traditional expression of Ellington’ s provisions, the street rhythms of Harlem, and the exotic-sounding trombone snarls, high-squealing trumpets, and muggy saxophone blues licks of the band members. Well, as of today in 1963 the President Kennedy assassinated. We were ready to write for it showing a lot of paper items related with the assassination. But then again we thought: macabre news that everyone will mention today, on Thanksgiving day. So we decided to write about music! Write about Joseph-Maurice Ravel the French composer known especially for his melodies, orchestral and instrumental textures and effects and his Boléro. Ravel was born in the Basque town of Ciboure, France, near Biarritz, close to the border with Spain, in 1875. His mother, Marie Delouart, was of Basque descent and grew up in Madrid, Spain, while his father, Joseph Ravel, was a Swiss inventor and industrialist from French Haute-Savoie. 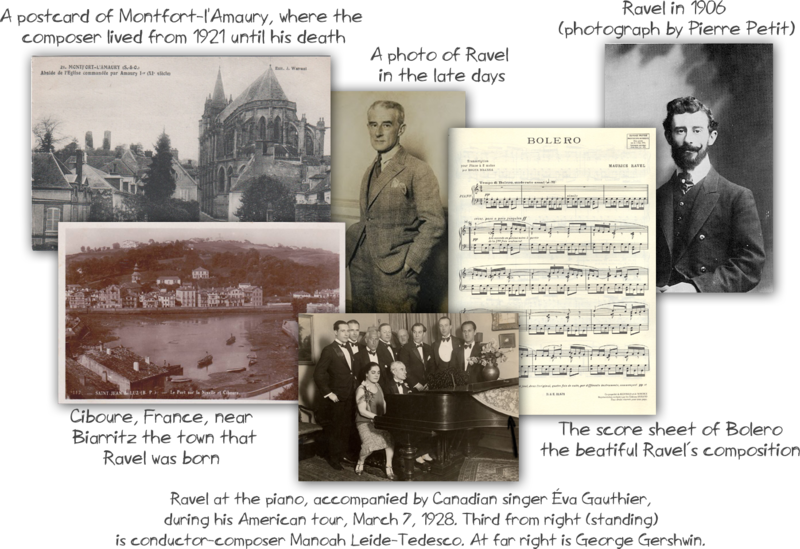 1928 Ravel made a four-month concert tour in North America, for a promised minimum of $10,000 (approximately $135,349, if we also make inflation adjustments). Ravel conducted most of the leading orchestras in the U.S. from coast to coast and visited twenty-five cities receiving a standing ovation. New Orleans visit caused him to include some jazz elements in a few of his later compositions. After returning to France, Ravel composed his most famous and controversial orchestral work Boléro, originally called Fandango. Ravel called it “an experiment in a very special and limited direction”. In 1928 on 22 November in Paris, “Bolero” by Maurice Ravel was first performed publicly. It’s amazing the quantity and quality of paper items you can find about music! Small sheets or whole orchestra scores, even rare handwritten ones, photographs, stamps, postcards and so on. Music lovers be prepared: a lot of “music” paper comes to eCharta!